"Doctor, of course I will not deny some fright, but I plan on fighting, fighting and more fighting!" Charlotte had her Avastin this morning and will start her Temodar tonight. We will be trying to attend our "Julian Open Studio and Gallery Tour" at our gallery this weekend. Hopefully the nausea caused by the Temodar will be kinder to her this weekend so that she can enjoy her friends. Charlotte right now has a slight headache from the Avastin, but is in very good spirits. We actually have a few people to thank for that. First, her sister Donna, for always being there at the Avastin treatments, and then bringing laughs and smiles to our faces during lunch. Lunch was at Tio Leo's again today, and thank you again Pete for making it so enjoyable. And a very special thanks again to Nancy Grossmann, R.N., at Kaiser Permanente for putting up with my never ending questions while Charlotte is getting her Avastin. I can not say enough about how much she means to us. Another thank you to Dr. Iris Lowe for doing her chiropractic work so that Charlotte is able to continue to walk, and even work, without her being in pain. Walking is so important for patients that are on Avastin to avoid blood clots. One gallery Charlotte wants to visit again is Gallery 21 in Spanish Village in Balboa Park. First, she has so many friends in Spanish Village that she would love to visit again. Dr. Lowe is also currently in a show "Friends of the Chinese Brush" now at Gallery 21 (October 30 -November 17) from 11-4pm . Unfortunately we will not be able to attend the reception this Sunday (4-6pm). But seeing the show and all of her friends in Spanish Village will fit nicely into one of our "walking routines". Finally, the news about Charlotte's last brain MRI was that her tumor is "stable". Charlotte had her Avastin last Thursday (Oct.16th). We had another appointment with Charlotte's chiropractor, Dr. Iris Lowe, that same evening to help Charlotte with some hip, shoulder and neck problems. Dr. Lowe felt Charlotte's upper vertebra were starting to fuse together, which kept her from walking in an upright position. She came out of there looking, and most importantly, feeling like a new woman. Charlotte and I worked together at the gallery over the weekend because Mary had a beautiful wedding to put on for a dear friend. It was good to see Charlotte interact with all of the customers, and then find time to work on a small sculpture. Charlotte had a 7am appointment at Kaiser on Monday (Oct, 20th) for her bimonthly MRI. I think there have been some policy changes at Kaiser because now they make you wait about a week for the "official" MRI report if everything is stable. They do a cursory look within 24-48 hours to see if something abnormal appears, and will let you know. But for some reason, as we were leaving because our 20 minutes were up with our neuro-oncologist, I believe she happened to mention that she no longer reads the MRI ahead of time. It's too bad because I think she is, in my opinion, the most qualified to read the MRI. She has seen things that the regular neuro-radiologist has not seen. We fully trust and respect her. I get the feeling that Kaiser is starting to demand some policy changes from their doctors that are not necessarily in the patient's best interest, but I could be wrong. Anyway, I guess we are now in the routine of "no news is good news" for the week. Which, for a proactive husband with a wife with brain cancer, is troubling. I receive emails from other patients and they asked me about this new delay in finding out about their MRI. I told them just what I said above, but that I didn't question it during the visit. I know the clock is running during our appointment, so I told them that I always prioritize my questions before entering. I must mention, the one true angel since day one, when no other doctors or nurses were around to respond to my urgent emails, etc., is Nancy Grossmann, RN, at Kaiser (Zion). She is the liaison nurse between the study trials and the patients in oncology. She has always returned my phone calls or emails, and helped us in so many ways. Kaiser, give her a pay raise, but don't give her any vacation time! I panic when I know she is not there! My main job for the last three months has been trying to weigh our options for when Charlotte's tumor returns. As previously mentioned, usually the tumor comes back with a vengeance, and is usually no longer responsive to chemo drugs. Also the Avastin may cloak the tumor so that the MRI looks great, but the clinical condition of the patient declines. Avastin may also make the tumor come back in a more diffuse pattern, so surgery may not be an option. These are just a few of the things that have come out concerning Avastin. I think for Charlotte her best option would try to get into a vaccine trial at UCLA. I've emailed Dr Linda Liau who is charge of the program. The big restriction (besides the cost) is that Dr Liau would need to do another resection on Charlotte for a fresh tumor sample in order to make the vaccine. Due to UCLA's policy and regulations, this surgery can only be done at UCLA, not Kaiser. Our neuro-oncologist thought that the trial could cost us $100,000. Another option for us would be If Charlotte's tumor comes back as an operable mass that could be resected at Kaiser, I could then send the tissue sample to the Weisenthal Cancer Group in Huntington Beach for tumor cell profiling. They would test Charlotte's cancer cells against 20-30 chemo drugs (and combinations) to see which might be most effective. But again that's chemo, and after Avastin, chemo may not be effective. Plus, I've seen it first hand, the body can take only so much chemo. I think the vaccine would be a lot easier for her. Another limiting factor for Charlotte is that most trials want newly diagnosed GBM patients. Charlotte will now be classified as a patient with a recurrent GBM. That limits my options for finding a trial study even further. I don't even know if Charlotte would qualify for the above vaccine trial. There are so many limiting factors to consider (trial cost, trial location, Charlotte's health at the time of reoccurrence, etc.). I just hope Kaiser will give me answers to my questions in a timely manner so that I can further decide what options are actually viable for us. Charlotte had her Avastin and Temodar today. She had to have a special blood pressure medication (Clonidine) just before the Avastin because her blood pressure was too high. Generally, this has been a month with problems for her, but yesterday she looked magnificent to me. Her normal blood pressure medicine has been increased, and a new blood pressure medicine has been added. She seemed to have her "chemo fog " for all of the month instead of just a week following the Temodar. Her speech and memory have just slightly regressed. But she reads her Mary Oliver, Sarah Teasdale and Walt Whitman poetry out loud every night, along with playing her flute. To me, all of these are inspiring and well done. 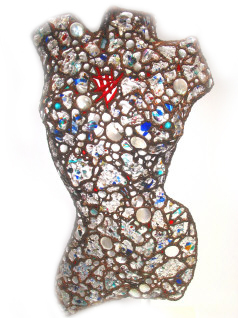 And of course her sculptures are exquisite. I even had her help me with some Internal Revenue Service forms and some California State Board of Equalization forms. It was sort of a test, since the "math" side of her brain was where most of the GBM (glioblastoma multiforme) was located. She still managed to do a good job. I have learned you can not just ask her questions in order to find out exactly how she is doing. Some things are obvious, but usually I have to be more intuitive. I remember when she came out of surgery at Kaiser Permanente, the nurse was testing her and asked her who the President of the United States was. She couldn't say "President Bush", but she answered that she could draw his face for the nurse. Today, if she met either Senator Obama or Senator McCain, she would shake their hands, complement them both equally, and tell them each to have a wonderful day. She does that to everyone now. I think that is what aggressive cancer brings out in the truly special people of this world. She has this very strong belief that every person is precious, and needs to be acknowledged. She has always felt this way, but these feelings seem to grow in intensity with each passing day. Charlotte working on a sculpture last week. Today Charlotte had her Avastin. For lunch, we went with Donna to Tio Leo's, a nearby Mexican restaurant. 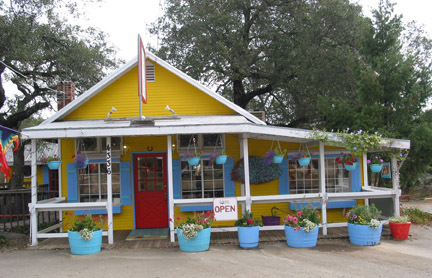 Donna helped the owner 30 years ago open the restaurant. She did everything from hiring, to managing it until it was up and running. One of her "hires" was Charlotte. Everything was new, and they needed an artist to rosemal (Swedish painting technique) the backs of all the booths and some of the doors. Charlotte remembers that we stayed there until the wee hours so that they could open on time. We were surprised to see all of her beautiful work still looking like new. Leo is now retired, but we met his gracious manager Pete. I just faxed all of Charlotte's previous MRI results to www.virtualtrials.com. I'm enrolling her in a patient study database. I will be updating her condition monthly. This is an anonymous database, but the results of everyone's fight with cancer, their treatments, their successes and failures, will be made public. It will help those in the future to choose a treatment strategy. The pharmacist once mentioned to me when I was picking up Charlotte's Temodar pills "Oh, she has what Senator Ted Kennedy has, a GBM (Gliobastoma Multiforme, Grade 4/4). I told him I did not know exactly what Senator Kennedy had because of his wish not to have his specific condition made public. My wish, and Charlotte's, is to help as many people as soon as possible by giving them all of her treatment information. I hope someday that there will be one website where people can go to find what treatments hold the most promise, both short term and long term, and then what might be their best "second strategy" after reoccurrence. Someday it would be nice to see a flowchart that shows all of the best primary treatments, and then under each of those a flowchart of the best secondary treatments specific to that initial treatment, and so on. I believe each initial treatment attacks the tumor in certain ways, so there can not be a redundancy in the second treatment if you hope to have success. But that is what this virtualtrials.com database is all about. Lets see what works and what doesn't. The above photo shows one of the unusual side effects of Charlotte's chemo regiment. Long finger nails! Yes, they are real and very healthy! 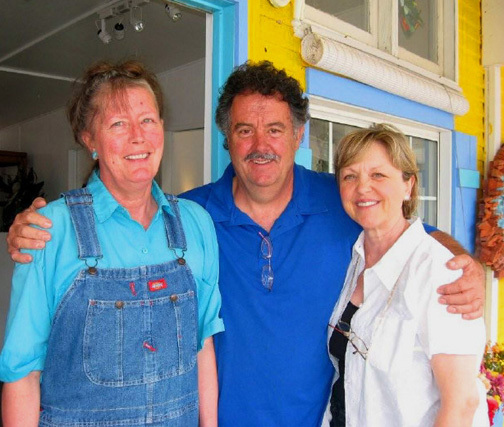 Charlotte and I just returned from having lunch with her sister Donna at CoCo's. That's our special treat if Charlotte feels up to it after having her Avastin. The Temodar will start tonight. The MRI results came back "stable" again, but there were a few new white spots that began to show up on the MRI before this one, and remain. As I'm learning, there could be many interpretations for these new spots. It could be the "radiation still doing its thing", "shine thru"(? ), etc. In fact, as we know in Charlotte's case, the tumor is definitely there, but we just can not "see" much of it right now. Whether that's due to the MRI technology, or even perhaps the Avastin "cloaking" the tumor, I'm not qualified to say. I would love to be able to get a PET scan, but know I'd be turned down. I believe they are a lot more definitive on the activity of a tumor, but also a lot more expensive. Charlotte's WBC count has been very low, and last Thursday and Friday she had a sore throat. On Saturday she also started to run a fever. From my experience, if she starts with a low grade fever in the morning, it'll usually be high by 9pm. For 2-3 hours, it rose to 101.8. I'm to take her to the ER if it gets above 101. (I thought 101.5). I just did not want to put her thru that ordeal that late at night, plus she insisted she did not need to go. Sitting in the ER waiting room for a couple of hours can be more dangerous to Charlotte than taking a wait and see approach at home. Her fever dropped below 101 by 11pm. I kept taking her temperature every three hours during the night and it was just about back to normal late on Sunday afternoon. But by then I had caught whatever she had. Hopefully that means we've had our colds for the season. The above photo of Charlotte was taken in September, 2004, at the dedication of our new Julian Library. 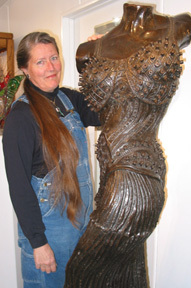 Charlotte is standing next to one of her replacement sculptures that she made and donated to victims of the fire that had also lost her art work. Charlotte is wearing her Mom's turquoise necklace that broke about a year ago. Her sister Mary found out about it and restrung for her. Mary always gives first class service, and brought it by early this morning so that Charlotte could wear it to her Avastin treatment. The picture and necklace story epitomizes the special people and events that make Julian so special. Charlotte had her Avastin today and will start her Temodar tonight. 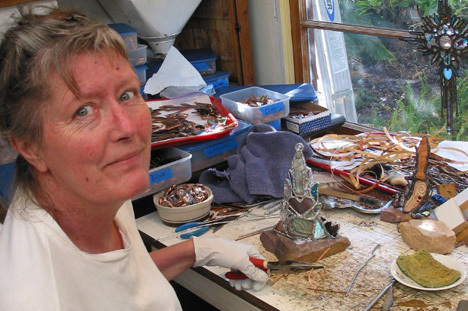 She's been working every day on her sculptures. She looks and feels good, but we've been having a few minor problems with high blood pressure and now a high potassium level. Her labs yesterday finally showed a little increase in her WBC count, but continues to be flagged for being too low. The other problem is her platelet level. It continues to decrease weekly, but hopefully there will be something preemptive by the doctors before she has to have another platelet transfusion. Both her WBC count and her platelet level drop (sometimes dramatically) due to the Temodar. Her next MRI is on August 25th. Charlotte had her Avastin today. Yesterday we went out and bought her a new outfit. She wore it to this morning's treatment and "wowed" everyone. She is accompanied by her sister Donna in the picture. We had a good visit with her brothers Gary and Craig, along with Gary's wonderful wife Lorie, over this past weekend. Mary ran the gallery while being the perfect hostess to us all. Gary was so kind and kept asking me if I thought Charlotte was getting too tired. I know what her limits are, but I keep trying to push them a little further each week when she is feeling good. I believe it makes her that much stronger the next day. Today she had her Avastin, but then the three of us went to Ikea for lunch (Swedish meatballs, of course) and then to Costco. She is sound asleep now, but I believe these "non-normal" days are helping her. Her next MRI will be August 25th. I asked the nurse today if maybe she might be able to handle an increase in the Temodar, and if the UCLA study would even allow it. It is the Temodar that is so hard on her system, especially her blood counts. So that is my first cosideration. But as I said in one of my earlier updates, my research seemed to show that some tumors seemed to come back with a vengeance around month seven. We're approaching that date now. Her last MRI showed her tumor to be stable. Perhaps an increase in the Temodar would let me hear those magical words of "her MRI reading shows a slight reduction in the size of her tumor". Charlotte had her Avastin this afternoon and I will start her Temodar tonight. Charlotte's MRI came back showing that her tumor "remains stable", so that was good news. My main concern now is her white blood cell (WBC) count. It has declined every week since her last Temodar treatment a month ago. Her Temador dosage this time was even increased from 280mg to 300mg. She usually has some sort of bounce in her WBC count during the month, but it didn't happen this time. I just have to be more aware of a possible infection, and try to avoid exposing her to those types of situations. Other than that, I believe she is entering this chemo session as strong as she has been in a long time. I just hope the increase in Temodar, along with her already low WBC count, will not set her back. Charlotte, to our knowledge, was the only "early" patient still enrolled in this Avastin/Temodar trial. Everyone that we had somehow met or knew about, was now "off trial". But we had kept hearing about this "older gentleman" that was able to continue on the higher Temodar dosage that the trial wanted you to start during your second month. That's when Charlotte's health took a dramatic turn for the worse. Yesterday, to our surprise, we met Tom and his wife Mary in the pharmacy. He is the "older gentleman" and is still on the higher dosage of Temodar. He still has fatigue problems, etc., but he couldn't get over how well Charlotte looked, and we could not get over how well he looked. We all compared notes on medication side effects, speech and memory problems, fatigue, etc. We exchanged email addresses, and hopefully will meet again. It was so good to see "two fighters" standing side by side. Mary Morgan sent me this link. I thought it was wonderful and just wanted to share. NPR asked people to complete the line "My Cancer..."
Charlotte had her Avastin this afternoon. Usually for her, there are hardly any side effects to this treatment. However, last time she had nausea and a bad headache less than an hour after the treatment. I'm just watching her more closely this time. Other than that, she seems to be in the middle of another great 3 weeks for her. She again got really sick during the Avastin and the following 5 days of Temodar (like last month). But since then she has been feeling a little better each day. She still is really weak in her legs and back. She now sleeps just 8 hours at night, and very rarely even takes a nap. She knows how fast her situation can change, but for now we're both very happy. We work everyday on our sculptures, and a few days ago we've starting making crosses again. To me that is a good sign. Her crosses are very labor intensive. Before this, she just wanted to do small pieces that did not tire her out. Her overall lab results are looking better too. But the MRI on July 1st will tell us more about the residual tumor, and how the Avastin and the Temodar have been working. We both know it's not a matter of "if" the tumor returns, but "when". But for us, that is just a fact of life. Right now, at this moment, we're able to work together and laugh together. Everyone should be so lucky as to have a soul mate, and to be able to share these precious moments. Charlotte had her Avastin and Temodar today. The "regular" dosage of 280mg of Temodar that she received last month and will receive again this month has greatly improved both her lab results and her daily routine. Her neuro-oncologist was very impressed by her appearance. She has gained some weight, and her muscle tone and color are returning. All of these she had lost. Her next MRI will be on July 1st. I wanted to share another email for an internet friend that writes to me about her precious Nick that also had a GBM grade 4. You will find the strength that you need. We don't know how strong we are until we are challenged. I remember the last couple of months someone asked me how I was doing and how I got through the days and still laughed. We would still find a lot to laugh about, of course we also had our tears. We talked a lot about death and Nick wanted a Native American death ceremony, so three weeks before he died I got him, and his puppy, from NC to NM and CO to meet up with a Sioux medicine man for the ceremony and so he could see the mountains again. He was so much more at peace with death after that. I know his spirit is in a peaceful place. I remember one day thinking I was numb.....you just get up everyday and do what needs to be done and you don't think about it, or what you have to do, or the consequences. There are no tears at that point, just functioning. You aren't sad, happy, tired, or anything......you just are, and doing what needs to be done. Your Charlotte sounds like a wonderful woman. You will always have her and your memories. Have you had a lot of years together? If there is anything you want to remember, write it down. With the stress you are going through now details could be blurry. Enjoy the times when you can just sit at the side of her bed, or next to her and talk and hold each other. Give her your strength....and hopefully you will both be blessed with her having many months and feeling better. Charlotte and I have known each other for 40 years. We met on Memorial Day weekend in 1968. (I still circle that date every year on my calendar with a little heart next to it. I do that for all the pets, people and events that have touched our lives.) I met her when she was beginning her senior year in high school, and we have been married for 37+ years. We are not only husband and wife, but best friends, and partners in everything that we have ever done. Charlotte had her lab work on Wednesday, and her Avastin yesterday. I wanted to actually see her this morning and also to see how she slept last night before writing an update. Two weeks ago during her last treatment she had a miserable night with nausea, and a swollen left eye when she awoke. This time she had a peaceful night and this morning she wanted to start working on a new sculpture. She had a very small chicken salad for lunch, then decided she was pooped. She is fast asleep now. I wanted to share an email I received from Susan in L.A. about a week ago. Somehow our website came up when she was researching GBM's. She wrote to say that her brother was diagnosed in May of 2006 with a GBM grade 4. She went on to say that he went thru a period of short term memory loss. But today, he is on Avastin and Temodar, and most encouraging, he is back to work and that his energy has returned. She wanted me to remain optimistic. This reminded me of my conversation with a brain cancer researcher during Charlotte's party on April 20th. He wasn't specifically talking to me about brain cancer patients, but cancer patients in general. He told me that most have to "hit bottom" before they start to recover. I still have to be driven by knowledge, but it did make a difference to know that there possibly might be a bottom somewhere out there. At least now I hope for one. Until Charlotte had breast cancer seven years ago, we didn't know there were eighteen different types of breast cancer. Unfortunately, I know now her cancer then and her cancer today are at the extremes on each list. But as I said in our last update, with her blood counts up, I get to be with her while she does the things that make her the happiest. And that is creating her sculpture. A close second for her would be to have a short conversation and hugs with her fellow chemo friends. Yesterday was our first regular "Thursday" chemo day since April 10th. Charlotte tells this story that when she was just a little girl, she remembers going to church with her Mom. Before falling asleep on her Mom's lap, she says she remembers the minister saying something about "goodness is love; love is goodness. I truly believe from watching how Charlotte interacts with other people, both for the past forty years and now during her fight, that "Charlotte is love", and that "love is Charlotte". Charlotte had her Avastin and Temodar today. Her last Avastin and Temodar was on March 27th, and her last Avastin was given on April 10th. Her blood counts all dropped dramatically due to the last increased dosage of Temodar. She was one sick girl, and I think the worst was two weekends ago. She has had a platelet transfusion, and I had to give her two series of three shots each of Neupogen to help bring her white blood cell count up to normal. During this time period she was also on antibiotics for a sinus and mastoid infection. Her last MRI on April 14th had shown Charlotte had hydrocephalus, and that a surgical procedure to install a shunt was being considered. However, she would need to be off her chemo for three months. We had an expedited MRI last Saturday. The doctor called on Monday saying that the hydrocephalus had remained the same, but that she was not considering the shunt surgery at this time. The MRI had shown "subtle growth in the residual tumor". Therefore, we had to restart the chemo treatments. Last Friday was the first day that Charlotte had some energy again. I could tell that her blood count levels were probably back to normal just from just her actions. 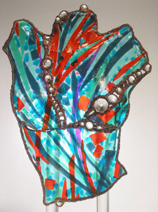 We started making a glass sculpture together, and have been working since then. She would discuss with me where each piece of glass should go as she laid them out. As she went back for a nap, I'd solder everything together. We would repeat everything until all the glass work was finally completed. Then came time for the wire work, and again she would discuss what was pleasing to her eye, and what was not. More soldering for me when she was asleep. 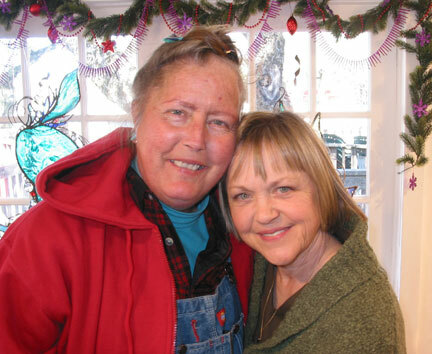 I have watched and helped her make probably thousands of glass sculptures over the past thirty years, but these last six days have been truly a blessing for both of us. For me, it's been selfish. I just wanted to keep working beside her, and to savor these moments. 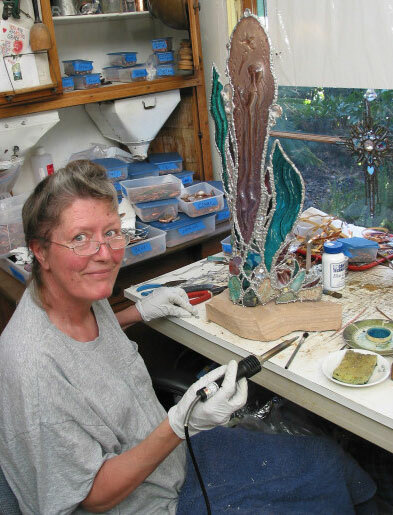 For her, she just wanted to keep creating beautiful sculpture that will bring some joy and beauty into someone's life. Charlotte and I would like to thank all of our friends and family again that came to our party on April 20th. It was a wonderful, loving day for Charlotte. She was very tired at the end, but her gallery has always been a place of strength, beauty and joy for her. Thank you all for adding to those on her very special day. The gallery will be closed until probably May 27th. After that date, please call Mary Morgan at 760-765-3584. The first Anniversary Celebration for the gallery was a joy for Charlotte. She was energized by the outpouring of love from her friends. Thank you all for coming. And many many thanks to all the volunteers who made this celebration possible, especially her sisters. Our friend Leena who makes these updates possible will be gone till May 4, look for another update after that. Charlotte had a low level fever yesterday, plus her white blood cell counts have been borderline, so we didn't know exactly what to expect today. But she did receive her Avastin this morning and she will be starting her higher dosage of Temodar tonight. Since her last Temador treatment a month ago, Charlotte has been spending probably 20 of her 24 hour day sleeping. We do still go for our three walks a day, but her "sleepiness" is both expected, yet troubling to me. I'm also decreasing her steroids and seizure medications, so that could also be a contributing factor. But I have also seen a decrease in her speech, memory and reading skills in the last week. Her doctor said it could be just a temporary condition, or edema (swelling) in her brain, or tumor regrowth. Her next scheduled MRI is on April 14th, but that will be moved up if I see her condition start to deteriorate. Charlotte also got joy and strength today. As usual, she talked to everyone in the oncology waiting room. She talked with a couple that we had not seen for a while, talked to an older blind lady that always enjoys hearing Charlotte's voice, and talked to a few "newcomers". They really appreciated her kind words and inner strength. Then after getting her infusion, Charlotte walked up and down the row of chemo chairs wishing everyone well. I asked her later about her conversation with the couple in the waiting room that we had not seen in a while. She said she just wanted to tell the woman to have no fear. "No matter what happens, have no fear. I don't". Charlotte had her Avastin treatment today. We were notified that a few of the other patients in this trial were having blood clots due to the Avastin. The one girl that is ahead of her in this study had one in her leg. They were able to treat it in time, so she is able to continue in the study. 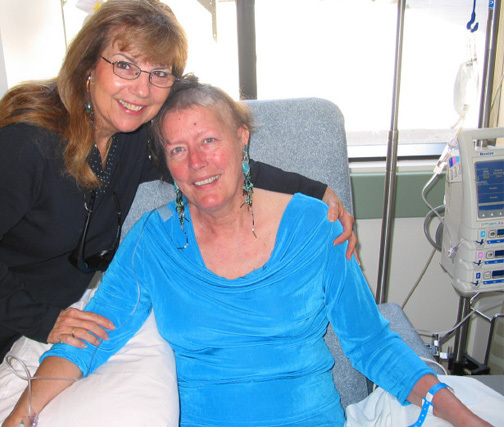 We had met someone else in radiation therapy that had become a good friend. We learned today that her blood clot had traveled to her lungs, so they had to take her out of this program. I was told again to watch for swelling feet and ankles, and also pain when Charlotte takes a deep breath. Charlotte also calls me her drill sergeant because I'm always trying to get her walk more often. It's easy when she feels good, but hard when she doesn't feel well. After today, she realizes how important it is to prevent blood clots when she's on Avastin. I also gave the nurse some information that I had found on brain-research@yahoogroups.com (first register at brain-research-subscribe@yahoogroups.com) just a few days ago. Two things were reported in a recent study. First, Avastin may "cloak" tumor regrowth during follow-up MRI's. Second, there doesn't seem to be a chemotherapy drug that is effective after tumor regrowth once you've used Avastin. (See messages #2532 and #2535). I am also asking UCLA for Charlotte's "methylated" or "unmethylated" MGMT report. They have Charlotte's tumor and the nurse said they should release this information to me. Temodar is more effective with a "methylated" MGMT. Actually, Temodar seems not to be effective if you have "unmethylated" MGMT. That's just my research, but I obviously hope Charlotte's is "methylated". Makes me wonder why this study doesn't tell people up front what some of these tests reveal from their tumor biopsy. I'm only learning now, after my "30 days of medical schooling", what are just some of the questions that should be asked. I'm too late on some questions already, but most of my time now is trying to figure out our options when the tumor returns. Especially after the above mentioned study in the brain-research site on Yahoo, our options may be very limited. I think the DCVac might be an option, but I think UCLA is the only place that may have a trial study, and I don't even know if it's open to recurrent brain tumor patients. Sorry if I'm getting too technical for some, but I know some other GBM friends may be reading this. Sometimes my head feels like it's going to explode with information over-load, or mainly having information that I just don't understand. I just know that my time is limited, and that I can not stop. I also know that if the roles were reversed, my beautiful wife would be more doing more than me. I also want to thank everyone for everything they have done. Everything from letters and cards, knitted caps and scarves, food (including Ultramet which she's using...drill sergeant again), firewood for the gallery, feeding our cat and peacocks, website updates, etc., etc. Thank you to everyone; especially to her sisters Mary and Donna. Charlotte wants to write thank you cards, but it is just not possible now. Please just know, that you are forever in her heart. Charlotte has been having a rough time since the beginning of her last Avastin and Temodar treatments. During this period we've also been trying to lower her Decadron and Keppra medications. She has been waking up with a moderate headache since Feb. 27th, after lowering the Decadron. We have further lowered it beginning three days ago, and she has been waking up to a #7/10 headache yesterday, and a severe #9/10 headache today, along with nausea and vomiting. The nurse gave me permission to give her another dosage of everything that was lost in one of these episodes. I've kept really good notes and realized all these headaches began when we started lowering the Decadron. Her neuro-oncologist will let me know tomorrow if we lowered her dosage too fast. The headaches could also mean more swelling in the brain, or other things that I will not discuss now. Charlotte has been in bed sleeping now for 5 days due to the fatigue from the Temodar, and the headaches. I remember my mom holding me when I was young and telling me she wished she could take all the pain into her body that I had when I was sick. When I held Charlotte today, I repeated that to her. It was one of the few times since all this began that I saw tears come to her eyes. I usually give her a massage twice or three times a day, but today her body hurt so much that she didn't even want that. We also found out that the girl ahead of her in this study did not want to continue after her first 28 days because of what I think Charlotte is experiencing now, which speaks volumes when you know there is basically no alternative. She did change her mind, however, and seems things are a little "easier" during her second treatment. I do not know what that means. I also don't know if they increased her Temodar dosage again as required, or kept it the same. Each day seems to bring something new, but as long as I have my beautiful wife, that's fine. Charlotte had her Avastin treatment this afternoon, along with more lab work. I did receive an email from her neuro-oncologist concerning the residual tumor area that she found yesterday. She believes "the area will improve with the current regiment, and that this area is not a region that we can do gamma knife because of the radiation she (Charlotte) has already gotten in the same territory and it is not demarcated enough for gamma knife". Charlotte will begin her five days of high dosage Temodar tonight. I found out that her immune system will be lowest probably during weeks two and three of this twenty-eight day regiment. Also, the one patient ahead of her in this study, did not feel well during the first week following the high dosage Temodar. Hopefully Charlotte will be different, but at least we will be prepared. Charlotte had a doctor's appointment today to review her last MRI and to get instructions on her next Temodar (chemo) treatments. The results of her last MRI from last week showed it "better than the post-op MRI, but shows some residual tumor." At this point, I don't know what everything means, and what our options are. Our doctor found this residual tumor while going over the MRI with us at the end of Charlotte's appointment today. The initial radiology report had somehow not reported this. We were told after surgery that the correct terminology to use from now on is "trying to control, and not cure"...the tumor. I don't know if her current treatments are effective at "containing" the tumor, or what other treatment options would be both available and as effective as her current treatments. I'm trying to find more information. Needless to say, this was not what I had expected to hear today. Charlotte will be starting her higher dose Temodar tomorrow when she receives her normal bi-weekly Avastin treatment. I've been researching everyday about Charlotte's condition. I've even talked with the executive director of The Brain Tumor Institute in New York a few days ago. (Hope the name is correct. I've talked with many people or researched so many websites that everything is a blur.) Basically, from what I've learned and from what she said over the phone, being enrolled in a clinical test is our best hope. And right now, both our neuro-oncologist and our neuro-surgeon have been the best! 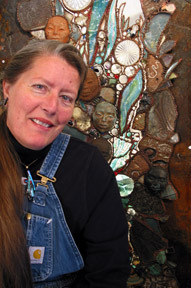 With the latest MRI results, I felt it best to cancel Charlotte's exhibition at Gallery 21 in Balboa Park. We've had people come as far away as Colorado, Minnesota, New Jersey, South Carolina and Florida for this show. She has a lot of loving friends around the country, and in Spanish Village in Balboa Park. To her friends in Spanish Village, thank you for inviting her to show again this year. She truly loved showing in Gallery 21, and will dearly miss everyone this year. Charlotte and I drove up to the gallery yesterday to pick up more supplies and to deliver some finished sculptures. We are "on call" for her next MRI, so we wanted to come back last night. Below is a wonderful picture that I took yesterday of Charlotte with her sister Mary. When radiation and the first treatments of chemo stopped, I was able to reduce one of Charlotte's Decadron pills. As the doctor told us, it's both our friend and enemy. It does keep the swelling down in her brain, but it makes all of her joints and muscles hurt, along with making her look more "puffy". On February 13th we first started on one short walk around the block, but now we are up to two walks. She does tire very easily, but her stamina has improved with the walks. I just want to get her as strong as possible before for her next series of battles. Between our walks and her naps, she continues creating new beautiful sculptures for her upcoming show at Gallery 21 in Balboa Park. Our gallery will not be open as often as in the past. Mary will now have it open Thursday thru Saturday, 1pm to 5pm, or by appointment, or anytime that Mary is home (just a few minutes away). Just give her a call at 760-765-3584. 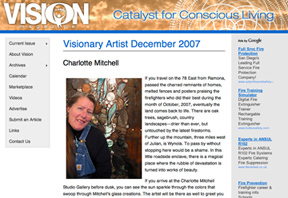 Charlotte read these updates for the first time last night, and she was almost in tears with joy over the wonderful job that her friend Leena Hannonen has done updating the site. Charlotte loved everything! Her memory is obviously not the same as before, so it was especially good for her to be able to reread the wonderful, well written articles in The Julian News by Laurel and Colleen. I have included a few more pictures that you can link to here. The pictures have all been taken within the past month. Thank you again everyone for all your love and help! Today was Charlotte's last day of radiation, and tomorrow she will receive her last Temodar pills. She will get another MRI in about two weeks to see how effective her treatments have been. She will then be off the chemo pill Temodar for about two weeks, and then she is to receive double the dosage for five days starting on a scheduled Avastin day. Then she will be off the Temodar for the next 23 days, and then they will again increase the dosage for five more days, followed by 23 days off. In between all this she will continue her Avastin every two weeks and continue seeing doctors and having more lab work done. I hope the MRI shows no new growth. Her last MRI on Jan. 3rd, showed that her surgeon had done an excellent job. With everything that she's been through in the last six weeks, it's hard to imagine anything but a positive result. My internet research has shown that with this type of therapy, the tumor seems to stay "controlled" until about seven months after the initial radiation and chemo, and then the tumor returns with a vengence. This has been such a learning experience for both of us. Who had even heard of "Glioblastoma multiforme" before? And it's the most common type of brain tumor for people our age! She is in excellent spirits, and is still creating art probably at the fastest rate that she has ever done. 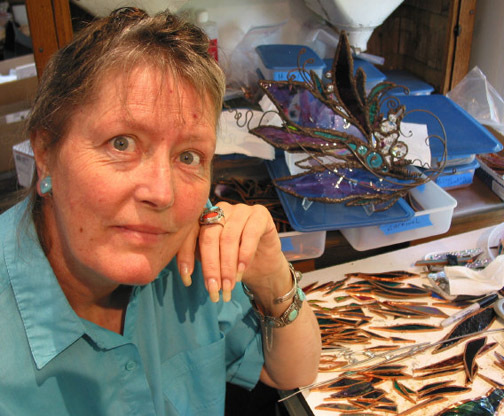 Her sculptures are also the most intricate that I've ever seen. They are absolutly beautiful! As her dear sister Mary Morgan would say, "you're not prejudice in thinking that, are you?" 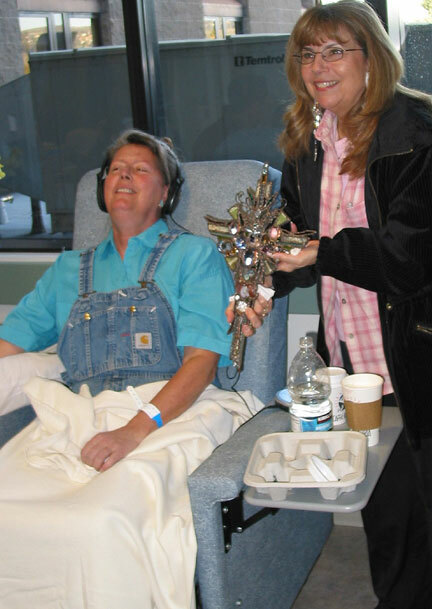 Her other sister Donna Hodge is in the picture holding her cross that Charlotte presented her during one of her Avastin treatments. Look at the smile on Charlotte's face! That is what I see everyday when we go to the hospital or to radiation. She is truly an inspiration to others; a cheerleader to those that are in the same situation. There were many heavy hearts today when they found out it was Charlotte's last day in radiation. They all loved her positive attitude and conversation. 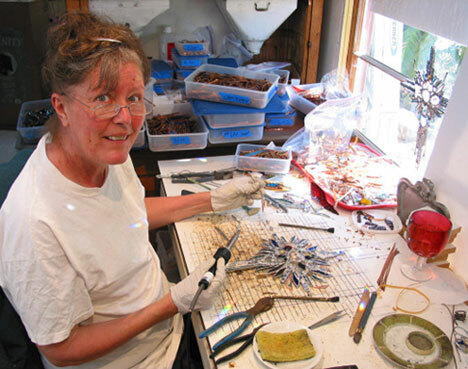 We are working on Charlotte's solo exhibition in Gallery 21 located in Balboa Park on April 3-13th. Her neuro-oncologist thought it would be good for Charlotte, so with the help of her sister Mary, hopefully it will be a wonderful time for Charlotte. There will be times when Charlotte has doctor appoinments, etc., and only Mary will be at Gallery 21. 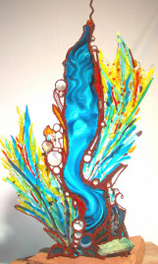 But hopefully the "Poetry in Glass" exhibition will be full of Charlotte's new sculptures that she is making now. 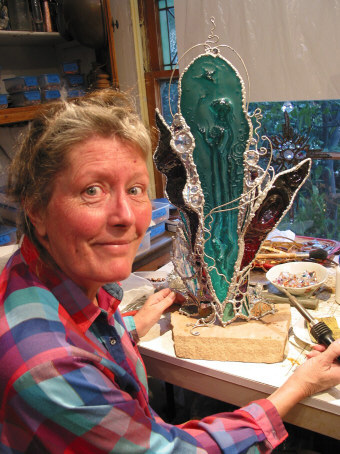 She truly believes her mother Genevieve is beside her during this journey, and is even helping with her sculptures. When she needs a certain piece of glass or ceramic piece to fit exactly where she wants it, all she has to do is to reach into one of her many boxes and it will be the first piece on top that she needs. It will fit perfectly! She'll tell me..."it's Mom again...go figure!!" 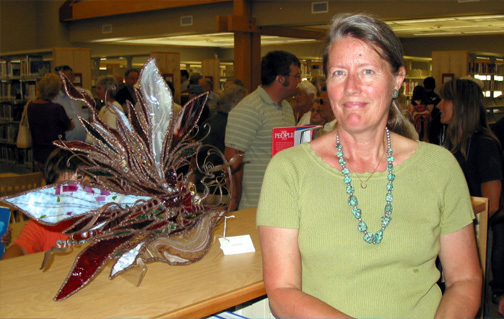 The Arts and Letters Committee of the Julian Library presented its January program last night which featured the remarkable video of Charlotte, entitled Poetry in Glass. Originally, it was thought that Charlotte would not be present due to her treatments but her doctor felt her blood tests were good and I knew the joy it would give her to see her friends and feel their love would far outweigh any possible problems. The evening began with the unveiling and presentation of a magnificent sculpture entitled HOPE which The Friends of the Julian Library had commissioned Charlotte to create for the Library. Charlotte was lovely as she delighted in explaining its significance and her reasons for choosing the poetry she had inscribed on it from favorite authors, Emily Dickinson and Antoine de Saint-Exupery. Charlotte recited the first verse of Hope by Emily Dickinson and encouraged the audience to use the Library to find and read the rest of it. Charlotte began her radiation, chemo and Avastin treatments today. Due to the need for a baseline MRI her treatment could not start as originally scheduled on the 2nd. She will generally have radiation Monday thru Friday but since it was missed on the 2nd she will have a treatment on this Saturday. Both Brent and Charlotte are feeling very hopeful and their spirits are good. The plan is that they will return each Friday after treatment to Julian and return to San Diego on Sunday afternoon or evening. Brent brought Charlotte back to Julian last night. Charlotte's first appointment yesterday was with the radiologist, where they made a mask of her head and did some measurements. Then Charlotte received a bunch of prescriptions again from her neuro-oncologist. The radiation, chemo, and Avastin will all begin on January 2, 2008, and continue through February 12, 2008. In between will be another MRI and various lab work, with another MRI at the end to see the results of her treatment. There was a similar Avastin program just completed at Duke University. You can link at www.newsobserver.com. beautifully she explained her love of poetry and art. Charlotte was home for part of Saturday and all of Sunday. Each day she feels much better and grows stronger. If you did not know of her health challenge, you would have thought she was just fine as she walked around the Gallery speaking of the many works displayed there. On Tuesday she meets with her primary care doctor and thereafter begins preparations for the start of radiation, chemo and Avastin. She says she is up for the fight and intends to get back to work as soon as she can. angiogenesis – the growth of a network of blood vessels that supplies nutrients and oxygen to cancerous tissues. Charlotte will return to Julian on December 18th. Charlotte continues to make progress. The Physical Therapist came today and ordered a cane so that she can walk around the house with more confidence and less chance of a fall. Her spirits are good and she is looking forward to returning to Julian. The next update will be on Friday after she visits with her surgeon and oncologist. 18th. This coming Friday she will see her neurosurgeon and have the staples removed. She thanks you all for the wonderful cards and notes of encouragement. Charlotte was released from the ER last night at 9:30 p.m. The cause for her rise in temperature appeared to be an infection. After a CT scan and blood work, it was determined that she had a urinary tract infection. This most likely resulted from her last stay in the hospital. Brent has been taking her temperature today and it is back to normal. Her spirits are good, she is beginning to eat and walk around the house. She and Brent remain in San Diego at their home. Her first radiation treatment will be December 28th. This morning Charlotte was not feeling well and Brent was advised to bring her to the ER at Kaiser. They reached Kaiser at 10:00 a.m. and a CT scan was performed. It is now 5:30 p.m. and they are still waiting to speak with the neurosurgeon. The nurse thinks that Charlotte will spend the night there. Brent and Charlotte plan to return to their San Diego home when she is discharged. They will have Home Health care while they are there. It is a service they cannot receive if they return to Julian. Charlotte will need a great deal of rest during this time. Her spirits are good but she is experiencing some head pain tonight. Charlotte had what Brent is calling a "slight regression" last night around 6:00 p.m. She was having difficulty remembering and naming things. This morning that continued somewhat and the surgeon said that it may be like this or it could improve with time. If Charlotte does not immediately know your name, she'll always appreciate you reminding her. his round the clock care. Brent spent the night at the hospital with Charlotte and by 9:00 p.m. she was able to converse with him. Today she is in very good spirits and is eating and able to walk around. Her surgeon visited and sent her for an MRI so that he can see better what remains of the tumor. The report should be available tomorrow. If all goes as planned Charlotte will return home tomorrow to rest and will then return to Kaiser on Friday to confer with her oncologist. She thanks you all for your thoughts and prayers. Charlotte's surgery lasted 5 hours. The surgery went well as far as the procedure but Dr. Gerras was not happy with what he found. The tumor was more aggressive and had penetrated further into the brain than anticipated. The initial frozen section revealed the tumor to be a Grade 4 / high grade Gliobastoma multi forme. The formal pathology report will take 3 - 5 days. Charlotte is able to speak and follow commands. She should be home by the end of the week. She will need quiet & rest. As is expected Brent is devastated by the severity of the initial report. Brent is appreciative of your support, thoughts & prayers. Yes, I would like to tell everything about this current problem so others will know and more folks someday will get a better treatment too if unfortunately it happens to them. Only about a week ago have I noticed the speech discontinuing which made me nervous. At first I thought it was more of 6 year-old breast cancer, which it was not. But it turned out to be worse as it is a tumor on my brain that cannot fully be taken out. I am scheduled for December 4th to have the surgery, even slower than the doctors wanted as we needed to make my water levels in the tumor come down so they will be able to see better. The most modern treatment was $600,000 for each of 10 from all over the country, most were close to death, but I have heard of at least one miracle...Fortunately, our doctors thought my tumor was a bit smaller and with Kaiser, will not cause me $600,000...WOW! I then told our doctor today only two things as I do not talk well. 1. Walt Whitman and Emily Dickinson used to be my favorites until I heard a year ago- "What is it you plan to do with your wild and precious life? 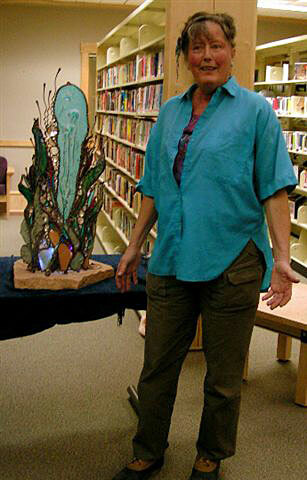 "...Mary Oliver is the poet of many beautiful works and is now my favorite I use in many sculptures. 2. Doctor, of course I will not deny some fright, but I plan on fighting, fighting and more fighting! After the surgery, my heart may be in danger for quite a time, but especially three days after. About 30 days starts chemo-therapy for a very long time, stilling and hurtful- bring it on! I am ready for anything! That is about all now other than the fact my doctor said that art was on the other side of my head...whoopee! Thank you for all the concern. Love to all, Charlotte Mitchell. Hours will depend on her health, so please call ahead. with lots of flare, love, and grace! See more photos from the gallery here. request a time convenient to you. please call to confirm the hours above. Copyright © 2006, Charlotte Mitchell. All rights reserved.